The second volume of the Wool trilogy is a prequel which starts in the present day and takes the reader up to the point when the events of the first book took place, several centuries in the future. Much of the story centers around Donny, a US senator and the architect who designed the silos. Finally we find out who was behind the disaster that drove humanity underground and what their plans are for the future. It took me a while to warm up to this book because some of the elements I liked about the first book weren't there. In Wool Silo 18 was full of dynamic women like Jahns, the mayor and Juliette, the engineer and rebel. The world of Shift, both before the disaster and within Silo 1, is dominated by rich white men. I suppose that's the point, but I missed having women characters I could cheer for. In Silo 1 the women are literally put on ice, to wait out the centuries until it is safe to return to the surface. Only one is illicitly woken and hidden away, and she is something of a femme fatale. Anna is an unlikeable straw woman character who seems to be included to make Donny's wife seem saintly by comparison. Even in Silo 18, Crow, the elderly teacher is pretty much the only female character who gets to actually do anything. I suppose Silo 18 was dominated by men (in particular, those of I.T.) in Wool too but I didn't notice it as much when the focus was more on Juliette. Unfortunately the story also drags on a bit, with long periods where nothing much is actually happening. I suppose that gives you a sense of what it might be like to live in a timeless place like one of the silos. In this volume we also find out what happened in Silo 17, and how Jimmy, or "Solo" came to be living there alone. His story is a heartwarming contrast with the macchinations of Silo 1. There is also a new character, Mission, introduced, who has a tragic backstory of his own. I felt for Mission, but found it hard to care about Donny, who is such a passive character, always reacting to events but rarely driving them. It's interesting seeing some of the conversations that took place in Wool from the other side and putting the pieces together. 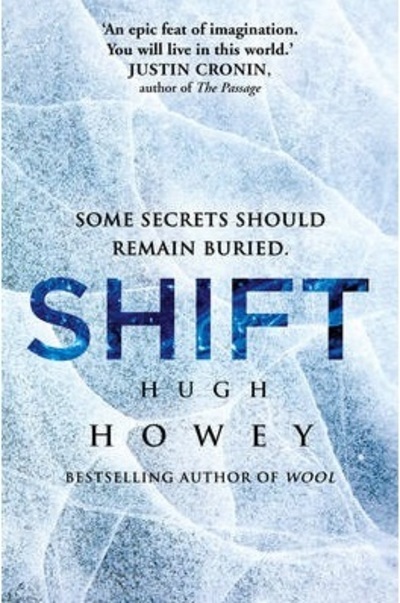 The future of all the silos remains uncertain and while Shift is less than perfect I will still definitely read book three, Dust, to find out what happens to them.